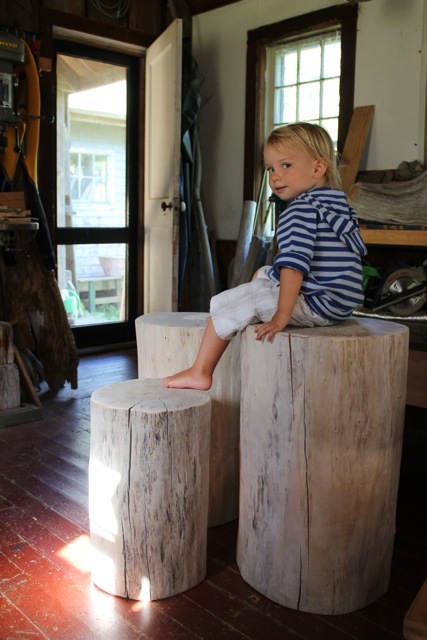 what a weekend – Designs Adrift (the business I co-own with Michael) went on the road… Michael, Finn and I (with the help of some friends and family) – exhibited in the Maine Craft Guild Show on Mount Desert Island, Maine, and what a success it was! 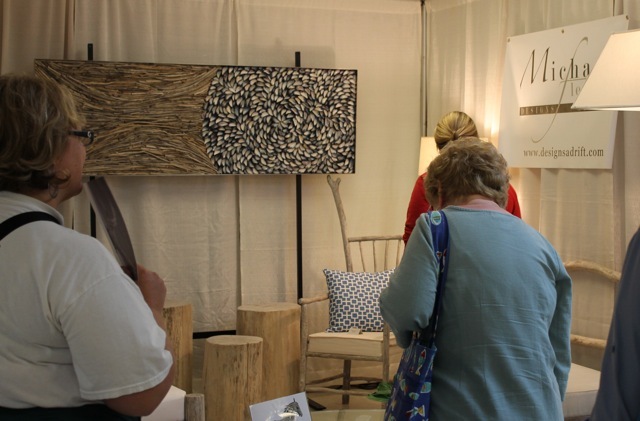 It’s a juried show of some of Maine’s finest craftsman and artisans…this year was the shows’ 37th. 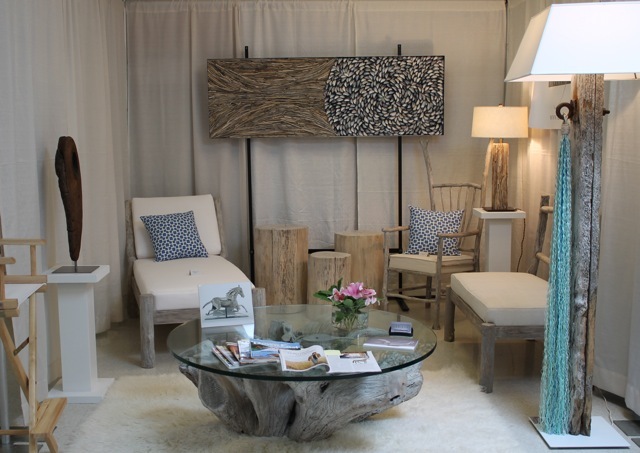 year; it’s well known (and highly respected) in the area as well as afar as the place to see and buy Maine art, furniture, jewelry and pottery. 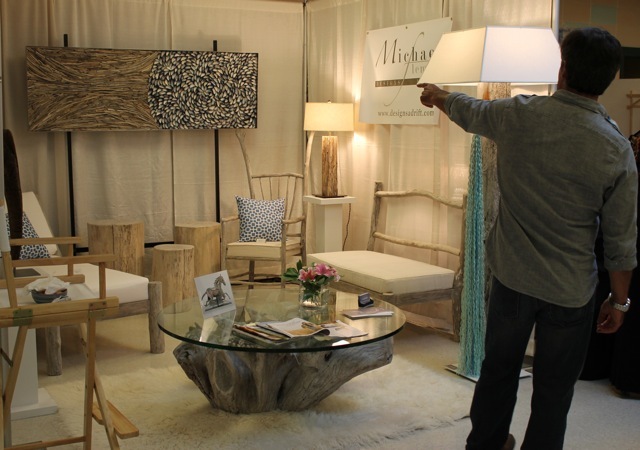 It was our first year as exhibitors and we are already looking forward to next year. 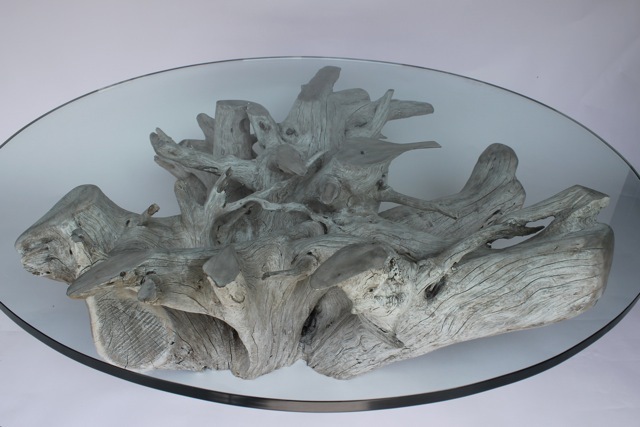 the driftwood coffee table also found its’ permanent home – ocean side, in Seal Harbor, Maine. A few other pieces were also scooped up by vey enthusiastic buyers…new friends were made, future prospectives were gained and a hectic but good time, was had by all. A big thanks to our friends and family who helped make it all happen – we couldn’t have done it without you! remembering to bring all those necessities – ladders, tape, extension cords, etc., preparing food (ahead of time) for everyone for the long weekend – I wanted things to be simple over the weekend so I prepared three nights dinners as well as lunches, snacks and appetizers ahead of time and froze. At the end of a long day, turn on the oven, choose a meal, pop it into the oven, enjoy a cocktail with appetizers and relax (well, sort of, with a two year old running around it’s not quite ‘relaxing’)…all the effort and work paid off, we had a very successful and fun weekend. The area of Mount Desert Island is absolutely stunning and we were fortunate to have stayed in a lovely little cottage in Northeast Harbor, compliments of a family friend. So thank you again to all who made this weekend absolutely incredible and if you find yourself on Mount Desert Island next July, do stop by the Maine Craft Guild Show and check out Maine’s best…enjoy. This entry was posted in everyday life, home, photography and tagged art shows, custom furniture, driftwood art, driftwood furniture, Martha Stewart, MDI juried art show, Michael Fleming Designs Adrift, Northeast Harbor, photography, working for oneself by ripe red berries. Bookmark the permalink. deserved success…..all the hard work really shows how dedicated you are to what you love.